A Simpsons still from the A Perfectly Cromulent Election Tumblr page. The Tumblr page A Perfectly Cromulent Election has been making the rounds on social media recently, using still images from the popular cartoon show The Simpsons to poke fun at the campaigns for the April 19 provincial election. The page features various screen captures from episodes of The Simpsons with satirical captions about recent events in provincial politics. 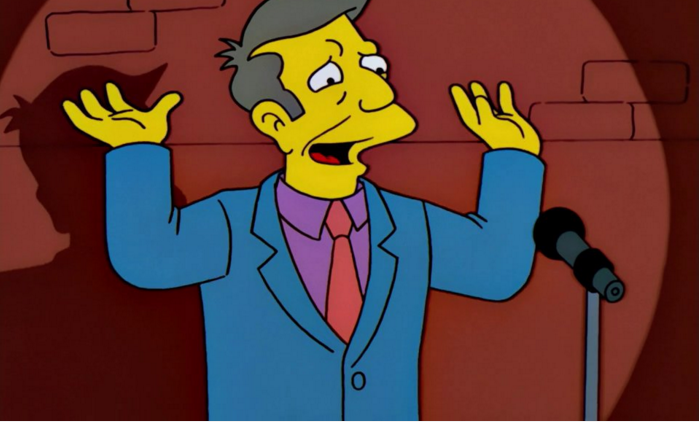 Characters from the show are likened to local politicians, such as Principal Seymour Skinner as Manitoba Progressive Conservative leader Brian Pallister, or Artie Ziff as Tuxedo NDP candidate Zach Fleisher. Behind the blog is Winnipegger Kent Davies, who first started using the images as a way to vent his frustration about the current political climate in the province. What initially began as an inside joke among friends soon expanded when a friend of Davies created the Tumblr account where he now continues to upload his Simpsons angle on election issues. Davies, who has friends that are involved with many of the political parties, did not expect the page to receive so much attention. “[It brings] a little levity to a situation that’s less than ideal,” said Davies. Davies makes a point to try and treat all parties equally, and does not avoid making fun of any individual or party in particular. Visitors to the website will likely appreciate the humour from their local riding. “What’s funny is that I have friends who are [in politics] and they wilfully let me make fun of them and their campaign,” said Davies. A fan of The Simpsons himself, Davies believes the cartoon’s recognition and relatable messages contribute to the blog’s popularity. Davies does not have plans to continue the blog after the elections are over, but may consider a future version for the next municipal election.